Michael Moorcock's first fantasy book, Stormbringer, the first of the long-running "Elric" series, appeared in 1965. Moorcock was a songwriter and member of various rock banks, including Hawkwind and Deep Fix, in the 60s and later. He became editor of New Worlds in 1964, and turned it into a literary magazine publishing the "New Wave" in SF. 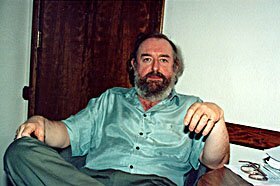 He's been a prolific novelist, with series including the "Jerry Cornelius" books (beginning with The Final Programme, 1968), the "Owen Bastable" adventures (first was The Warlord of the Air, 1971), and the "Dancers at the End of Time" far-future series (beginning with An Alien Heat, 1972). Moorcock's series eventually became intertwined as a single "Multiverse", with characters appearing in various incarnations in various books. Moorcock won the Nebula for "Behold the Man" (1967), the Campbell Memorial and World Fantasy Awards for the ambitious literary/fantasy novel Gloriana: or The Unfulfill'd Queen (1978), and numerous others. His current work includes the crossover series Blood: A Fantasy, The War Amongst the Angels, and Fabulous Harbors. ''Getting honored in science fiction is easy, too easy. To me, it's been an easy ride – and that's not meant to be arrogant. It has been easy, and the basic puritan work ethic leaves me with a huge amount of evidence that I shouldn't be praised for it. People praise you for things you did in three days, and they think it took a year to do. When somebody's doing work in the house and I'm writing, I feel guilty because I'm not doing some physical work – it's that old-fashioned simple. " ''I've observed other writers, people I've admired, but some just locked at a certain point and became self-parodic. It's something that's always scared me, so for years I developed a habitual system of going off, taking the odd chance, doing things just to keep myself from getting too full of myself, too interested in my own myth and work. So anything which divorces me any further from real life and real people is something I'm careful about. And being honored at conventions can make you feel very full of yourself." ''Now I'm doing the last 'Pyat' book. I thought I'd finish it this summer, but I got sick. Now I'm over the most difficult parts – which deal with Hitler. It's appalling, but the concentration camps are plain sailing after that! I'm also doing a London novel called, at the moment, King of the City. And I'm doing the comic, Moorcock's Multiverse. I started out, with 'Blood' and that sequence, thinking, 'I'll just have a bit of fun doing fantasy.' Then I started getting just as involved and curious about what you can do with it as I'd be with anything else, because it ceases immediately to be an easy job I could do in five minutes. The good thing about the comic is, it actually acts very well as a complement to the kind of fantasies I'm doing.